This month has been incredibly encouraging as we’ve started approaching organizations and inviting them to join our community. We’ve received overwhelmingly positive feedback from several organizations that are very excited about the way we can reduce and simplify their workload. Now, we’re looking forward to working with them in the months ahead and welcoming them into Tandempark. Of course, one of the most memorable parts of July was working with Startup Barrie to get them set up and using the first release of Tandempark (say, whaaat?!)! 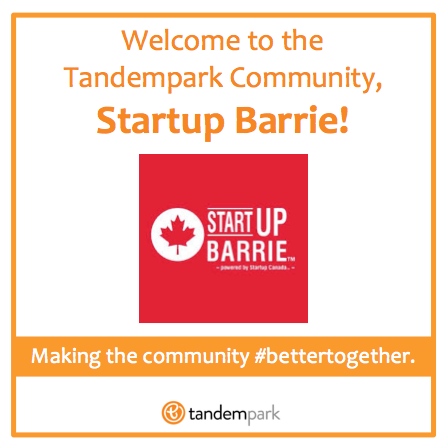 That’s right, Tandempark 1.0 was up and running in time to help Startup Barrie launch their first volunteer meetup and start organizing and managing their volunteer teams. Their organization is doing some amazing stuff to bring together and equip the entrepreneur community in Barrie, Ontario. And while we chose to launch this early release before all the features were ready, it’s already being recognized for the value it will have on Startup Barrie’s year ahead. “I’m super stoked about Tandempark and so grateful for all your help with the volunteer management aspect. It’s given me huge insight to how important your software will be to Startup Barrie,” said Christine Whone, Startup Barrie Community Builder. We couldn’t have said it better ourselves. If you are interested in helping Startup Barrie in the events and projects they plan for the year ahead, click here to sign up and connect with their organization. Thanks to Rhubarb Media and Gateway Software! Launching a tech startup is no easy task and we’re glad to be surrounded by such amazing talent! These two key suppliers have been instrumental in helping get Tandempark where it is today and prepared for where it is heading in the months ahead. Rhubarb Media has been great in taking the vision we brought them and turning it into a polished brand. See that dashing logo? They did that. Pretty sweet, right? They were also part of the early design stage in exploring and outlining some of the processes that underly the services Tandempark offers. We’re glad they saw the vision and potential so clearly when we approached them two years ago. They’ve been nothing but helpful! Gateway Software Productions has been working tirelessly over the last few months to turn our ambitious goals and vision into computer code that gets the job done (even if it is completely beyond our understanding). The results they’ve produced have been nothing short of awesome and with what we have planned for our next update, we think you’ll agree that they are doing an incredible job! So some pretty exciting stuff at Tandempark. If you haven’t already read our July smOffice update, you should! Otherwise, that’s all for now. There will be a lot more to come so stay tuned! We’ll be updating again soon.